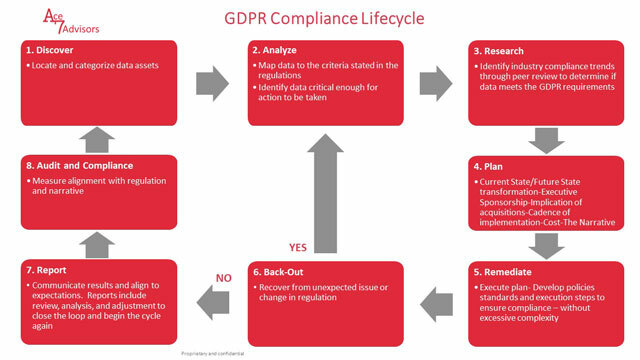 Ace 7 Advisors can assist you through the compliance process using our GDPR Compliance Lifecycle methodology. Partnering with Ace 7 Advisors for GDPR ensures that you will obtain compliance and stay compliant through monitoring and auditing. The General Data Protection Regulation (GDPR) for the European Union applies to companies processing and holding personal data of subjects residing in the EU. Personal data is any information that can be used to directly or indirectly identify the person. This regulation applies to organizations located outside of the EU if they offer goods or services to EU data subjects. Organizations can be fined up to 4% of annual global turnover for breaching GDPR or €20 Million. Consent must be given by the data subject (customer or employee) in an intelligible and easily accessible form, with the purpose fr collecting the data attached to that consent – meaning it must be unambiguous. Explicit consent is required only for processing sensitive personal data – in this context, nothing short of “opt in” will suffice. Companies will no longer be able to utilize long illegible terms and conditions full of legalese as the request for consent. If you have customers or employees located in the European Union you have to comply with this regulation or risk being fined. Contact us today to discuss how we can help you with GDPR compliance.